The Fox News host purports to side with “normal Americans” over greedy elites, but fails to tell his viewers the truth. The monologue was compelling. It is easy to imagine large swaths of the viewing audience concluding that, if nothing else, the host is on their side. But Carlson failed the most basic test of respect for his audience: He told them blatant lies, falsehoods, and untruths, assuming that they wouldn’t notice. Some of us did. A broadcaster’s untruths can be difficult to hear in real time, especially if he’s talented at modulating his voice and looking into the camera. But Carlson ranged across so many different subjects that he inevitably covered some terrain that the educated viewer would know a lot about. In those moments, his mendacity was unmistakable. If you really loved your fellow Americans, as our leaders should, if it would break your heart to see them high all the time. Which they are. A huge number of our kids, especially our boys, are smoking weed constantly. You may not realize that, because new technology has made it odorless. But it’s everywhere. They add that “among 12th graders, around six (5.8) percent continue to report daily use of marijuana, which corresponds to about one in 16 high school seniors.” Carlson could’ve used those numbers and let viewers assess the degree of the problem for themselves, but vagueness allows him to make it seem as if pot use is growing more pervasive . 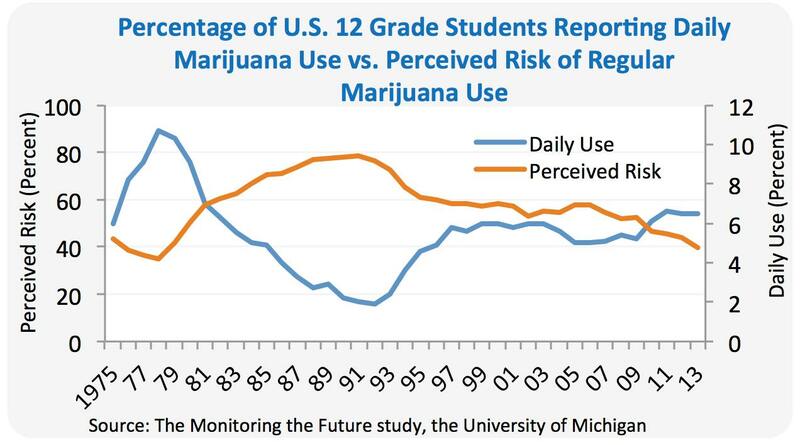 Actually, teen marijuana use was much higher in the late 1970s. Once our leaders understood they could get rich from marijuana, marijuana became ubiquitous. In many places, tax-hungry politicians have legalized or decriminalized it. Former Speaker of the House John Boehner now lobbies for the marijuana industry. His fellow Republicans seem fine with that. “Oh, but it’s better for you than alcohol,” they tell us. Who cares? Talk about missing the point. Try having dinner with a 19-year-old who’s been smoking weed. The life is gone. Passive, flat, trapped in their own heads. Do you want that for your kids? Of course not. Then why are our leaders pushing it on us? You know the reason. In this telling, greedy elites are pushing marijuana legalization on the public to line their pockets, never mind Johnny’s dead eyes at the dinner table. And that narrative is absurd—it is flat-out, demonstrably untrue. The American public is not a powerless victim of elites on marijuana legalization. Sixty-two percent of Americans believe that marijuana should be legal! Where the recreational use of marijuana is legal, odds are very high that it got that way via ballot initiative. Voters in Washington and Colorado legalized marijuana in 2012. Voters in Oregon and Alaska (which has a long, complicated marijuana policy backstory) legalized marijuana in 2014. Voters in California, Nevada, Maine, and Massachusetts legalized marijuana in 2016. And Michigan voters did it in 2018. “2018 began with Vermont legalizing marijuana possession and home cultivation for adults,” Kris Krane writes at Forbes. “This was the first time a state had ever legalized marijuana through the legislature.” No state legislature has ever legalized marijuana over the objection of its voters. The U.S. Congress is, in fact, going against the will of the majority by preserving the federal prohibition on marijuana. The truth is the opposite of what Carlson tells his viewers as he tries to seduce them with the false narrative that they are thwarted victims of elites “pushing” marijuana on us. On marijuana, for better or worse, “normal Americans” are slowly but surely getting their way—and while that might mean marginally more 19-year-olds are high at dinner, it also means marginally fewer 19-year-olds are getting arrested for pot possession, or seduced into selling pot, or shot in the violence that inevitably results, touching even non-pot-users, when black markets are the only way to get a product that lots of people will always buy. Of course, I don’t need to tell the 62 percent of you who support marijuana legalization that you’re motivated by an earnest belief that it’s the better policy to advance the public good, not by greed or callousness. You should be angry that Carlson is misrepresenting you to his audience. Everyone should hate that he is dividing us based on falsehoods. Five years ago, when the mayor of Washington, D.C., announced plans to push for legalization of marijuana, Carlson was asked about it on a radio show. People feel under attack from their government. They have every reason to feel that way. And so I understand why they’re very suspicious of the war on drugs. Does D.C. need more high people? No. I’m not for the War on Drugs either, but the truth is, if you’re a middle-aged man like I am and you’re getting high all the time, it’s depressing! This is a country with a ton of lazy, entitled people. It’s been rich for 70 years. So inevitably you have people who just don’t work very hard or have a lot of ambition. I don’t think smoking more weed is going to fix that. Look, I’m against the drug war. I think we should let people do what they want to do. But these libertarians I run into think that legalizing weed is like the panacea, the answer, are stupid. In other words, Carlson understands perfectly well that one can oppose the drug war and believe we should let people do what they want to do without being motivated by greed or callous indifference to one’s fellow Americans or thinking “getting high all the time” is a good idea. Most of Carlson’s monologue was about subjects other than marijuana. It gained its power in part from the grains of truth sprinkled throughout. Some contradicted longtime pieties that need to be challenged. Of course, there are discrete examples of corrupt elites wronging the public, as there are in all societies in all eras. But finding remedies—and avoiding cures that are worse than the disease—requires care and precision. Pandering monologues uttered with no particular regard for factual accuracy are an impediment to seeing what’s wrong and fixing it. They are contempt and disloyalty for the audience masquerading as their opposite. In the autumn of 2017, Carlson was profiled in GQ. Readers learned that he has paid a premium to spend his life in upper-class Washington, D.C., society, among the very people he purports to disdain, dining at upscale restaurants, joining exclusive private clubs, and sending his children to pricey private schools. I don’t begrudge him those choices, but has he really chosen to surround his family with people he regards as greedy, callous monsters who constantly betray their country? Either his views are more nuanced than he lets on or his judgment is terrible. In that profile, he declares of immigration, “That’s not a subject that I’m demagoguing on,” leaving one to wonder what subjects he is consciously demagoguing on. Of Washington, D.C., he told the writer, “There’s this illusion, and it’s created by the people who live here, that everything is meaningful, everything important. It’s not.” It’s a convenient worldview if you’re hungry for ratings and know that intellectually honest commentary isn’t always the most effective way to get them. Untruths hurt real people. Try having dinner with a 79-year-old who watches Tucker Carlson every day. They’re anxious, angry, trapped in their own heads, and thinking of themselves as aggrieved victims. That’s why every assertion and argument on matters of national import that a popular TV-news host offers is “meaningful” and “important,” especially if it’s crafted to provoke an emotional response in viewers.